Potsdam’s Donnie Johnson (14) drives the ball to centerfield for a single in the second inning. 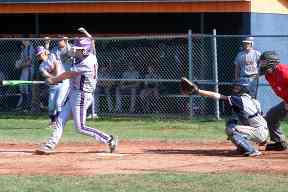 However, the Sandstoners were unable to capitalize or string together hits to produce runs against O.F.A. pitcher Ethan Baldwin. Baldwin twirled a two-hit shutout and struck out seven in anchoring the Blue Devil victory. Barr and Jackson Troiano led the way with two hits. 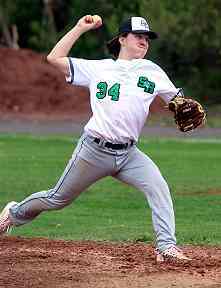 Salmon River pitcher Matthew Harvey (34) throws a strike to end a productive five-run inning for Potsdam. 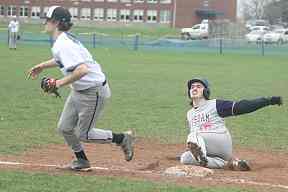 MoMorristown’s Brett Gleason beats a high throw to first base to put two Rockets on board in the first inning, but M-W pitcher Evan Ruddy worked out of the jam unscathed. The Jackets racked up five runs in the first, four in the second, then exploded for nine runs in the third inning of Game 1. Morristown broke up the shutout in the fifth inning. Every starter in the Jackets lineup scored at least one run. The second contest produced similar scoring with three runs in the first and four in the second. Morristown trimmed the lead to 7-2 with a pair of runs in the third. The Jackets virtually sealed the win with a six-run outburst in the fourth. 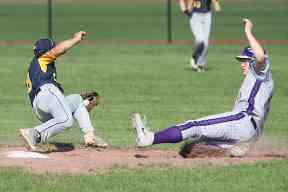 A Canton baserunner slides into third base, beating the throw from leftfield and the tag from Salmon River third baseman Timothy Cook (12). 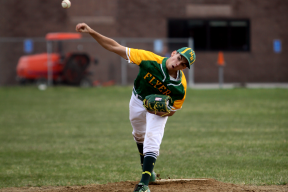 Jack Finnerty led the Bears on both the mound and at the plate with 13 strikeouts pitched and going 3-for-4 at bat. 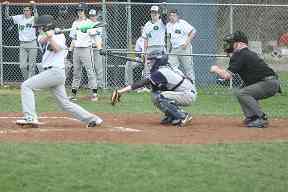 Cook led the Shamrocks, also going 3-for-4, while Shamrock ace Cameron Cartier struck out 10. Norwood-Norfolk pitcher Luke Allen gave up just one run on five hits, while collecting three hits at the plate in helping his own cause. 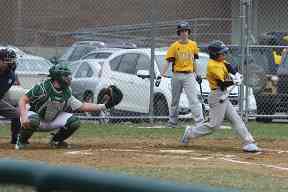 Caleb Bresett, Pat Smith and Seth Giilbert pounded out two hits each, while Bresett scored five times for the Flyers. 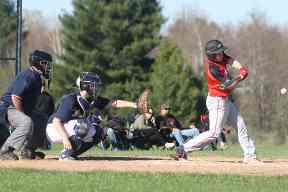 Chateaugay was led by Revelle and Brandon Bombard who stroked two hits each. Collin Dunn belted a triple. 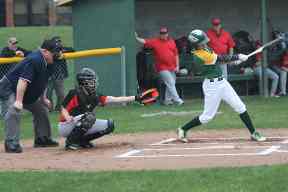 Heuvelton's Noah Steele (11) sends the baseball out of the "yard" to deep rightfield for a solo homerun in the third inning, providing the Bulldogs with a 3-2 lead in the third inning. 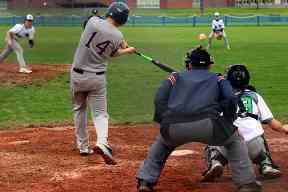 JV call-ups Will Roda and Noah Dominy, making their first varsity appearance, led off the pivotal fifth inning with back-to-back singles, triggering Potsdam's nine-run rally. 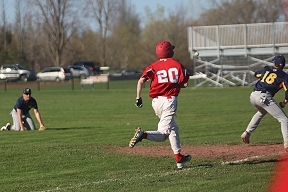 Both later scored on RBI hits from David Lucht and Keller McGowan. All four players and Don Johnson each had two hits. Parishville-Hopkinton Ethan Phippen (20) came on in relief of Kyle Woods in the fourth inning and dealt an inning-ending strike out in the fourth inning. Kolby Perkins went 4-for-4, Ryan Newtown cranked out three hits and Jarrett St. Hilaire slashed two hits in the Larries' win. 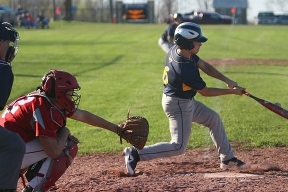 Sam Clark-Vallance led the Panthers with two hits. 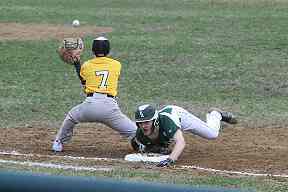 Madrid-Waddington's Owen Uppstrom (6) drives in the runner on third base with a sixth-inning single that extends the Yellow Jackets' rally. 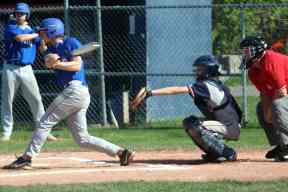 Parishville-Hopkinton edged out to a 2-1 lead in the top of the 6th, before the Jackets plated four runs in the bottom of the inning. M-W went on the beat the Panthers in a non-divisional matchup. (Bob LaRue photo) Game Gallery coming shortly. 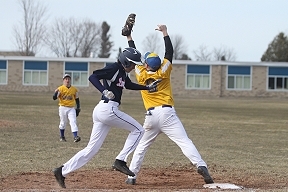 Madrid-Waddington second baseman throws from his knees after diving to cut off the infield grounder and throw out P-H's Ethan Phippen (20) at first base. Both teams scored runs in the first inning. P-H's Tanner Rosebarker opened the scoring in the top of the second, getting aboard when hit by pitch, then scoring on a Kyle Woods hit. M-W's Ryan VanPatten scored in the bottom of the frame on a wild pitch. 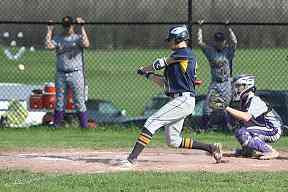 The game stayed knotted 1-1 until the 6th when Sam Vallence scored on Rosenbarker's base knock and RBI. In the bottom of the inning, the Jackets' first three batter all reached, with VanPatten, Dan Dominy and Evan Ruddy getting RBIs in the four-run outburst. Madrid-Waddington’s Ryan Van Patten (16) drives the ball into the gap between left and center fields to earn a double in the bottom of the fifth inning. He would score later in the inning. 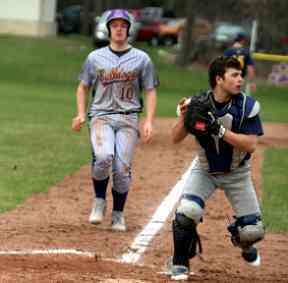 After Heuvelton trimmed the lead to 2-1 in the top of the fifth, the Jackets tacked on two runs in the firth and four more in the sixth inning to seal an 8-1 victory. M-W hurler Shane Tiernan tossed a four hitter and struck out 10. Kyle Field led the Jackets with two hits. Evan Ruddy and Caleb Lawrence delivered two RBIs each. 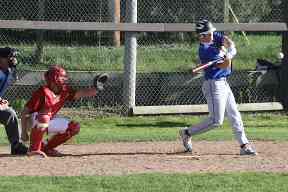 Dan Pray had two of the four hits for Heuveltopn. 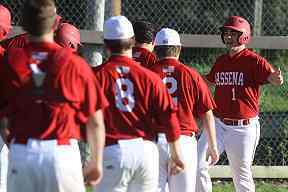 Massena’s Garrett Engstrom (11) celebrates with his teammates as he crosses home plate, after belting the ball into the Grasse River behind the right-field fence for a home run to give the Red Raiders an early 2-0 lead over the Wildcats. 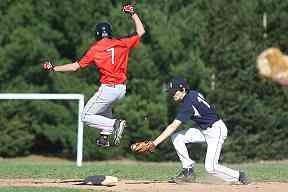 Brushton-Moira’s Josh Langdon (7) leaps over the attempted tag from St. Lawrence Central second baseman Trent Dow (12) to advance into scoring position in the bottom of the third inning. 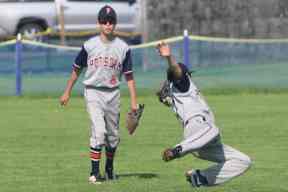 A Malone baserunner dives safely back onto third base beating the throw from the Canton pitcher in the fourth inning. 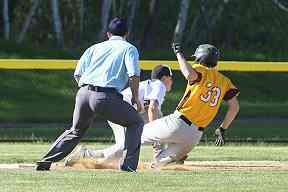 Tupper Lake’s Brad McLear (23) gabs a sacrifice fly back behind second base for the second out of the fourth inning. 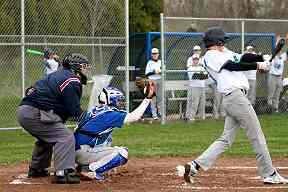 However, the Flyers netted a run from third, and got a second run on a throwing miscue to the plate. 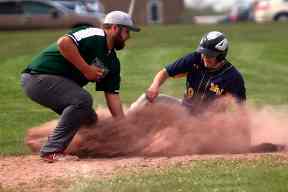 Norwood-Norfolk jumped on Tupper Lake for two runs in the first, three in the second and six runs in the third inning, in a 15-0 win. 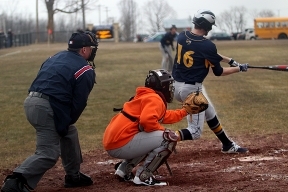 Bobby Voss led the Flyers with two doubles, and RBI and a run scored. 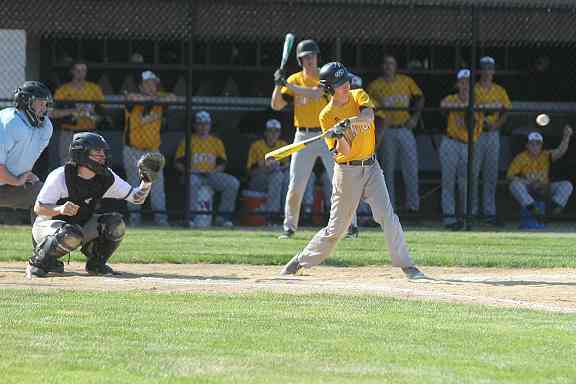 Reed Gravlin added two hits, an RBI and run scored. 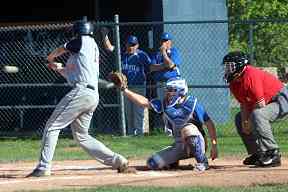 Connor Paige stroked two hits and scored a run. 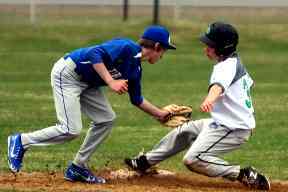 St. Regis Falls’ first baseman Riley Tucker (9) leaps to make the catch while keeping contact with the base to get the St. Lawrence Central base runner out to retire the third inning. Brushton-Moira’s Cameron Johnston (11) launches the ball deep into the gap between center and rightfield to earn a double, but would be stranded on base in the first inning. 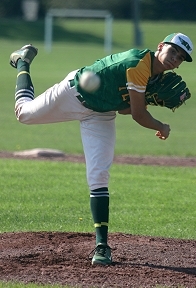 The Flyers' Luke Allen pitched a complete-game victory in the opener. 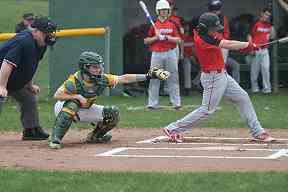 Allen stroked the game-winning hit in hte top of the 5th in the second game, after Caleb Bresett bunted to get aboard, stole second, then scored on the Allen hit. The Flyers produced only two hits in the second game, but won 3-2. 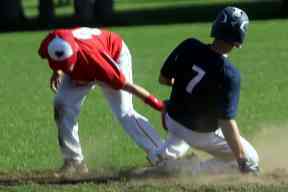 A Potsdam base runner slides back onto first base to beat the throw from the Shamrock pitcher. 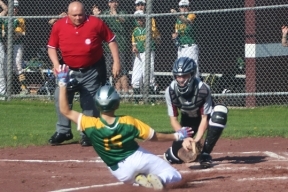 In a seesaw battle in the first game, Salmon River took a 5-4 lead on Cameron Cartier's bases-loaded double to the rightfield corner in the fourth inning. Potsdam strung together five straight hits in the bottom of the 4th to counter with three runs and regain the lead. James Robinson led Potsdam with four hits, including a solo home run, two hits and two RBIs in the twinbill. 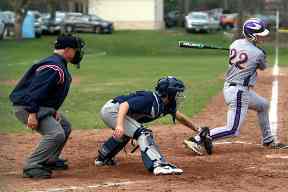 Zach Woods added three hits in the second game and a hit in the opener. 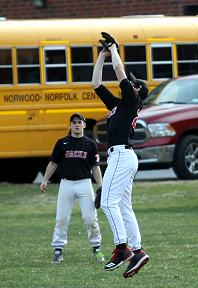 Madrid-Waddington catcher Owen Uppstrom (6) throws to first looking to complete a double play. In the fourth with the bases loaded, Heuvelton's Loren Putman gets beaned by a pitch for the game's first run. Noah Steele then walks to make it 2-0. Later, Jack Lake's single to left extends the lead to 3-0. Bryce Lake and Putman both scored in the 5th inning to build the Heuvelton lead to 5-0. Nate Moulton was hit by a pitch to lead off the M-W 7th. 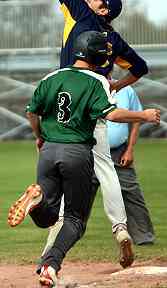 He then stole second, went to third on a wild pitch and scored on a grounder to second. Salmon River’s Cameron Cartier (99) hits a double in the gap to left-centerfield in the first inning. Cartier's double proved to be the lone hit of the same of the Shamrocks. 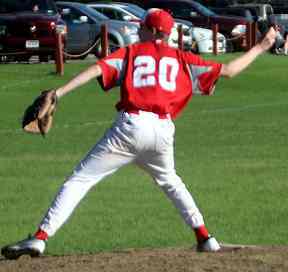 OFA's Ethan Baldwin and Jackson Troiano combined to pitch a one-hitter and 12 strikeouts in OFA's 9-0 win. 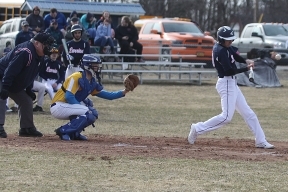 Ogdensburg was led by Justyn McCormick with two singles, along with doubles from Hayden Ives and Connor Griffith. 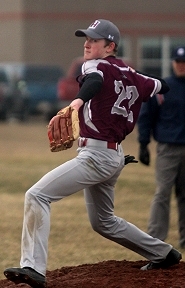 Harrisville’s Nate Woodward (22) works the mound. Copyright © 2001-2012 ref="http://communitysights.com">CommunitySights.com. All rights reserved. All logos, photographs, text, designs and online broadcasts are copyright. No portion of this web site may be copied, transferred, duplicated or otherwise used in any form without expressed written permission.